One always hears other Sai Bandhus say, that their actions are ordained by Shri Shirdi Sai BABA. I belong to that class of people who always assigns her actions either good or bad to BABA. I even justify this saying that is is good behaviour of a Shirdi Sai Follower, because this is what BABA asked us to do "Do not assign doership of your actions to yourself, be egoless only then your rise to spirituality would be faster". It flashed to me on a dull Thursday morning, which could only be by BABA’s inspiration that, - "are we not hiding behind the name of BABA, and escaping our responsibilities and shying away from our work, by taking out the name of Shirdi Sainath and assigning our sloth, laziness, irresponsible actions to Him. Is this what BABA meant when he asked us to assign the actions of this body to him? Is this what Sai philosophy taught us ?" Infact BABA meant to say - that by surrendering our actions to Him, we will keep thinking of the Supremacy of our lord and while taking HIS holy name our actions will be more condusive to the philosophy of Universal love and happiness. That way we do not harm, hurt, cheat our fellow beings, and we will not have any expectations of having done good or helped others, thus we will be egoless. When there is no expectations then our love towards other beings grows many folds, as it is unconditional and selfless love, thus bring us closer to BABA. BABA definitly provides us opportunities, HE has also endowed us with Knowledge to make best possible use of those opportunities in serving our dependants and community in a constructive way. But instead we humans are so malicious and manipulative, we accept God and his teachings and we interpret them to suit our needs. Hence we come up with this idea that "I am angry today - because BABA wanted me to be", "I wasted my time today - because BABA thought it was not correct time for me to do work", "I killed, cheated, misbehaved, tormented, somebody because BABA wanted me to do that". This is nothing but a castle of lies we built around us to satisfy our conscious, hence there is so much of ill feeling and bad qualities amongst. We are using that knowledge which is envied by gods in trying to convince ourselves of our actions are result of laziness, irresponsibility and cruelty. All the actions that are ordained by BABA and which we carry out, people do not experience personal gains, satisfaction or feeling egoistic. Hence it is essential for us to introspect and read our actions and determine whether we derived any pleasure or happiness as a result of the action, If we question ourselves on the reason for our behaviour, quality of the output as a result of the action, and did we think of God while doing the act? Such questions put us back on track of BABA and his teachings. Let us see what Hemadpant says with regards to our actions "If there be my Hari (Lord), He will feed me on my cot." This proverb is only true in respect of food and clothing, but if anyone trusting in this, sits quiet and does nothing in spiritual matters, he will be ruined. One has to exert himself to his utmost for attaining self-realization. The more he endeavours, the better for him". Chapter 18/19. 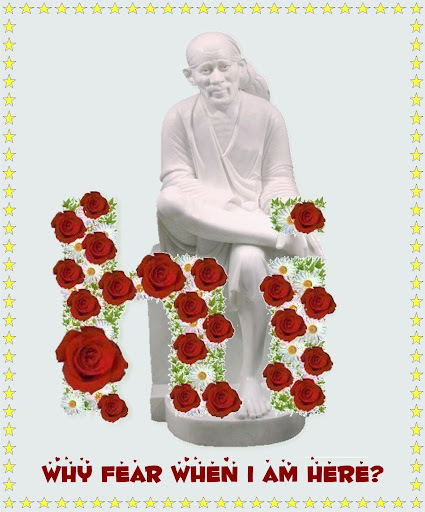 Great devotees of BABA always advocated reading of Satcharita - the beauty of reading Satcharita is that it is an unending treasure cove, as we keep digging we get new insight to BABA’s teachings. The purpose of why BABA instructed Anna Saheb to write His leelas dawns upon us. One has to gain a complete insight into the teachings of this Sadguru to understand the meaning of its content. I present to you a few instances of BABA’s quotes from Satcharita and beg each one of my Saibandus to read and interpret it. I rest my case here, and BABA is the guide who will enlighten us about our actions in light of Sai Tatva. "After performing many deeds of merit, you are born a man, and if you act like this, will Shirdi help you in any way?" Chapter 18/19. "Though I have become a Fakir, have no house or wife, and though leaving off all cares, I have stayed at one place, the inevitable Maya teases Me often. Though I forgot Myself I cannot forget Her. She always envelops Me.This Maya (illusive power) of the Lord (Shri Hari) teases God Brahma and others; then what to speak of a poor Fakir like Me? Those who take refuge in the Lord wil be freed from Her clutches with his grace".Chapter 13. "Sai Baba showed by actual conduct how one should get rid of egoism and do the duties of a disciple to attain the highest end, viz., Self-realization" Chapter 5. "Let us do our prescribed duty and surrender our body, mind and five pranas (life) to the Guru's feet. Guru is God, all pervading. To get this conviction, strong unbounded faith is necessary." Chapter 32. "It is on account of Rinaubandh (former relationship) that we have come together, let us love and serve each other and be happy" Chapter 18/19.